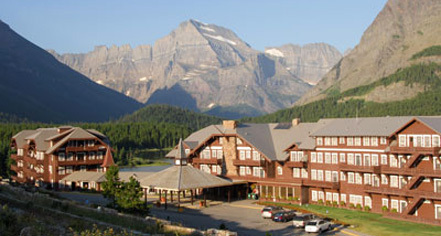 Featuring picturesque views of Many Glacier's magnificent peaks, the Ptarmigan Dining Room serves American cuisine for its buffet breakfast, lunch, and dinner with a fine selection of Montana microbrews. Boasting a casual atmosphere, the restaurant interiors complements the Swiss-alpine experience. Adjacent to the main Dining Room, The Interlaken Lounge is a Swiss-style lounge with beautiful views across Swiftcurrent Lake. The lounge offers Montana microbrews, wine, liquors, late-night appetizers, classic meals from the all day menu, and a daily fondue service at 2:00 PM. A Many Glacier Hotel experience is incomplete without trying the Après Fondue, a flavorsome signature four-cheese blend of Gruyere, Swiss, Parmesan, and Romano. Served with assorted fresh, crusty breads and crisp seasonal vegetables, the Après Fondue is an unforgettable culinary experience. Situated on the lower level, Heidi's Snack Shop and Espresso Stand offers hot and cold snacks, freshly made breads, hot dogs, sodas, beer, wine, books, magazines, and delicious huckleberry soft serve ice cream. 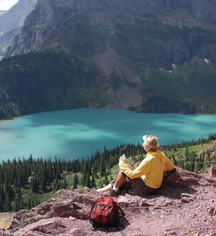 A Box Lunch is available by reservation for on-the-go days in Glacier and Waterton.